Iron Man #1 MARVEL 1968. "ORIGIN of Iron Man!". (1st App & ORIGIN of Daredevil) Daredevil #1. (1st App & ORIGIN of Moon Knight) Werewolf By Night #32. (1st App & ORIGIN of Brainiac) Action Comics #242. IF IT GRADES HIGHER WE WOULD LIKE TO HEAR ABOUT IT AND CELEBRATE WITH YOU! This is the only way to be 100% certain you will achieve. Respectfully Coast To Coast Comics. HASSLE FREE. All of our books have attached covers and centerfolds, all staples and pages, unless noted. Tales of Suspense #44. (Marvel Comics). You can judge the photos at the right, I am a comic collector, not a professional grader. (FN-) OFF WHITE PAGES. Tales of Suspense #42. (Marvel Comics). You can judge the photos at the right, I am a comic collector, not a professional grader. (FN) OFF WHITE PAGES. 1st appearnace of the Mandarin. Tales of Suspense #50. (Marvel Comics). You can judge the photos at the right, I am a comic collector, not a professional grader. (FN-) OFF WHITE PAGES. Tales of Suspense #47. (Marvel Comics). (VG/FN) OFF WHITE PAGES. Tales of Suspense #43. (Marvel Comics). You can judge the photos at the right, I am a comic collector, not a professional grader. (FN) OFF WHITE PAGES. 1st appearance Pepper Potts & Happy. Tales of Suspense #45. (Marvel Comics). _gsrx_vers_841 (GS 7.0.16 (841)). #11 - about VG the book is actually in very nice shape except it has a coffee stain on the top half of the book that affected mostly the back cover and the top staple. You can see it in the pictures. Tales of Suspense #59. (Marvel Comics). You can judge the photos at the right, I am a comic collector, not a professional grader. (VF) OFF WHITE PAGES. Tales of Suspense #58. (Marvel Comics). You can judge the photos at the right, I am a comic collector, not a professional grader. (FN/VF) OFF WHITE PAGES. Tales of Suspense #41. (Marvel Comics). You can judge the photos at the right, I am a comic collector, not a professional grader. (FN) OFF WHITE PAGES. Tales of Suspense #48. (Marvel Comics). You can judge the photos at the right, I am a comic collector, not a professional grader. (FN) OFF WHITE PAGES. Tales of Suspense #56. (Marvel Comics). You can judge the photos at the right, I am a comic collector, not a professional grader. (FN) OFF WHITE PAGES. (Marvel Comics). Iron Man #9. You can judge the photos at the right, I am a comic collector, not a professional grader. (VG-) OFF WHITE PAGES. Tales of Suspense #64. (Marvel Comics). You can judge the photos at the right, I am a comic collector, not a professional grader. (FN/VF) OFF WHITE PAGES. (Marvel Comics). Iron Man #1. You can judge the photos at the right, I am a comic collector, not a professional grader. (FN ) OFF WHITE PAGES. Due to timing differences, we will respond to you normally within 24 hours. 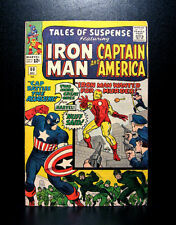 Tales of Suspense #42 4th appearance of Iron Man. Based upon other CGC graded comics in my collection it would be a 4.5 to 6.0. 1st appearance of Black Widow. Signed Stan Lee. 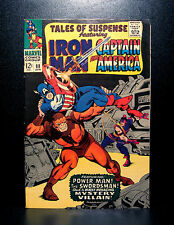 Tales of Suspense #52. (CGC 5.5) OFF WHITE TO WHITE PAGES. (Marvel Comics). You can judge the photos, I am a comic collector, not a professional grader. (Marvel Comics). Iron Man #10. You can judge the photos at the right, I am a comic collector, not a professional grader. (VG) OFF WHITE PAGES. (Marvel Comics). Iron Man #14. You can judge the photos at the right, I am a comic collector, not a professional grader. (VF-) OFF WHITE TO WHITE PAGES. Iron Man #1!!! Damage along the spine and lower right corner.... classic issue. Tales of Suspense #40 (April 1963) 2nd IRON MAN! Graded CGC 3.0 No Reserve! I enjoy reading them and that's what they should be for! This comic is complete with all pages included and it is suitable for reading. I bought #1 a couple months later, but it was being sold without a cover. Both comics lie nice and flat and the staples hold the cover tight. Issue #2 shows more wear, but issue #5 is still very nice. Tales of Suspense #60. (Marvel Comics). You can judge the photos at the right, I am a comic collector, not a professional grader. (FN-) OFF WHITE PAGES. First issue of Iron Man in his own comic back in 1968. 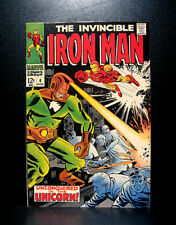 Up for your consideration is Iron Man 1 CGC 8.0 | Marvel 1968 | Iron Man Origin Retold. . Lot of 1 Books containing; Iron Man 1 CGC 8.0 | Marvel 1968 | Iron Man Origin Retold. Happy Bidding! Please read the entire listing prior to bidding or emailing your questions. Your question is probably answered below. For your convenience we have provided a list of answers to the most frequently asked questions. (DAREDEVIL THE MAN WITHOUT FEAR 1 #6. So I have collected many comics, Graphic Novels and books since the sixties'. 1st app and origin of Mr. Fear. MARVEL SILVER AGE 1965. Giant Size etc. will increase the weight and size, so will cost more a little more). 1st appearance of Modok. Tales of Suspense #94. (Marvel Comics). (FN/VF) OFF WHITE PAGES. 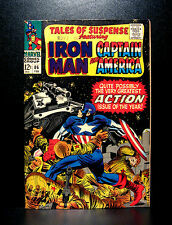 Up for your consideration is Tales of Suspense 41 CGC 6.0 | Marvel 1963 | 3rd Iron Man. . Lot of 1 Books containing; Tales of Suspense 41 CGC 6.0 | Marvel 1963 | 3rd Iron Man. Happy Bidding! Please read the entire listing prior to bidding or emailing your questions. Your question is probably answered below. For your convenience we have provided a list of answers to the most frequently asked questions.